Bite-size chicken. King-size opportunity. 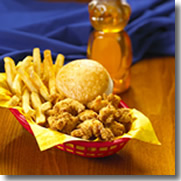 As a Rex Chicken franchisee, you get a proven menu built around a unique and popular product. In addition, you get a rich, experience-based restaurant concept that's entertaining, memorable and marketable to a worldwide audience. From the day we opened at an Oklahoma gas station, diners flocked to Rex Chicken. Word spread until travellers across the USA were mapping a route that brought them to Rex for crispy bite-size chicken, fabulous frybread and homey sides. We don't have a clue what makes people drive a thousand miles to see a gigantic leaping muskie or a palace of corn, but we do know what makes them stop by Rex Chicken — food too good to pass up. Q. What does the franchise system include? Operating manuals, policies, procedures, and business management systems. Q. Is there any experience necessary to own a Rex restaurant? A. Yes, but not necessarily in foodservice. Rex actively searches for candidates with a strong background in business management. Q. Do I need to be involved in the day-to-day operation of my franchise? A. At least one owner or a designated manager must be involved on a full-time basis and must be responsible for the day-to-day operations and management. Q. I'm interested in a Rex franchise. What do I do next? A. Fill out the personal profile form and return it to the address indicated. A Beautiful Brands representative will contact you and start you down the road to owning your own business. Interested parties should have at least $100K to invest. 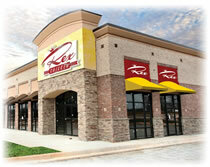 Click on Request Information button above for FREE information on how to start a Rexs Chicken franchise today! Please Note: Rexs Chicken franchises for sale, and other franchise opportunities, business opportunities, businesses and franchises for sale on this web site are not to be considered as an "offering", "franchise offering", suggestion or recommendation by GlobalBX. The franchises, businesses and business brokers seen on this web site submit their own individual content. This advertisement depends entirely on the truthfulness of the information provided by our advertisers which includes, but is not limited to, franchisers, franchises, franchise brokers, franchise consultants, business sellers and business brokers. As always, GlobalBX recommends that you consult a lawyer, financial consultant, accountant or professional advisor before buying a franchise or business opportunity or any type of business. By submitting this form and requesting more information, you have agreed to all terms and policies of GlobalBX and the business and franchise offerings listed here. Please review our Terms & Conditions for more information.